Machinery And Equipment of Emulsion Bases - GlobeCore Bitumen Emulsion. Reduction of binder expenditure by 25-30% and increasing of the strength of the resulting material due to the relatively low viscosity of oil-in-water emulsions. Generally, emulsion is the name for a dispersion system, which consists of two mutually insoluble liquids. In the case of bitumen emulsion, bitumen phase is finely milled (dispersed) and mixed with dispersing medium, water. Bitumen emulsion cannot exist without another important component, the emulsifier, which is required to increase dissolution resistance and to facilitate the manufacturing process. To obtain bitumen emulsions, various machines and systems can be used. We’ll consider the most common ones. Homogenizer-dispersant. It is the continuous action equipment. It is intended to crush one fluid in another by applying higher specific mechanical energy to liquid in a narrow gap between a rotor and a stator at the circumferential speed of the rotor and the stator. Turbomixer is a device, which is composed of special cams, fixed in concentric circles on the front side of a rotating rotor and on a removable stator lid. Turbomixer reminds a disintegrating mill by its design. Special mixers can also be used for producing bituminous emulsions. The principle of their action is based on chemical emulsification at increased amounts of surface active emulsifier. The most economical in terms of energy consumption are paddle mixers with a small number of turns. Next come helical stirrers, and the least economical are turbine mixers. 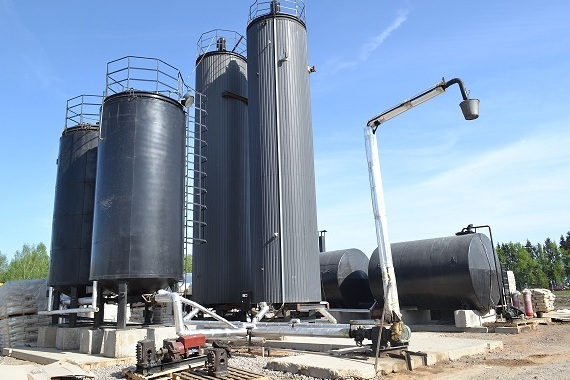 Acoustic emulsion systems can also be used for the production of bitumen emulsions. Hydrodynamic and electromechanical vibrators serve as the sources of sound and ultrasonic vibrations in such systems. GlobeCore offers a fully equipped UVB-type plants that are designed to produce bitumen emulsions of absolutely all types and designations. Quality of the product obtained by means of using GlobeCore equipment, meets all international standards in the field of roads construction and repair. This is achieved through the use of KLM-type colloid mills. This device is specially designed to produce highly stable colloidal solutions, mixtures and emulsions by means of the so-called “wet” grinding. Additionally, complex geometric surface microrelief of the rotor creates greater turbulence which breaks bitumen particles. Inside the mill there is a process of fragmentation of the product between rotating and stationary cylindrical calibrating athwart-radially milled teeth of a rotor and a stator. Under the effect of centrifugal force and high relative speed between the rotating rotor and the fixed stator, liquid and semi-liquid materials become uniform, finely dispersed and homogeneous. The mill allows simultaneous dispersing and homogenizing.